The emerald shape diamond is defined by its step cut (yes, “step cut” and not “steep” cut). Within the industry, a step cut defines a stone’s facet rows. While many diamonds contain a “brilliant” cut, the emerald shape diamond utilizes the former facet cuts to create additional, larger facets. These facets, when crafted well, create a mirror-like effect. The stone’s overall cut then resembles an elongated staircase, or “steps”, highlighting the iconic name. While many step cuts exist, the emerald shape diamond is one of the most popular among Houston diamonds. The emerald shape diamond utilizes many facets alongside a shortened girdle and regular pavilion. Due to an emerald cut’s size, angle and shape, a diamond’s facets may show less brilliance overall. Additionally, a stone’s fire may be lessened—and light dispersion may be contained within the gem’s facets. However, emerald shaped diamonds do display the stone’s classic elegance and beauty. This aspect is exclusive to emerald shape diamonds, and it doesn't appear in other cuts. For many, the emerald cut diamond deploys a subtle tint, a small reflection, and little refraction when compared to brilliant cut diamonds. Historically, emerald cut diamonds have been implemented into rings. However, they’ve dominated square-cut stones in popularity—becoming a lucrative ring cornerstone. 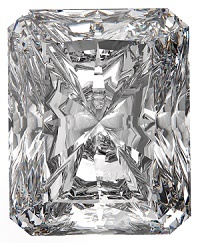 An emerald cut diamond is often less expensive, as its overall cut is natural. Carving a rough diamond needn't be difficult to achieve an emerald cut, as the shape’s natural sides and facets exemplify the stone’s structure. Additionally, long-sized emerald rough diamonds may be obtained at even lower prices. Carat weight, quality and shape are all determined by the buyer, and many varieties scale—price-wise—from the stone’s overall facets. For many, finding the best emerald cut diamond requires open, large facets. Due to the stone’s overall shape, large facets increase otherwise diminished clarity and color. Considering a brilliant cut is urged for those seeking visible lower grades. However, a classic emerald cut utilizes a length-to-width balance ratio of about 1.30. This ratio may be useful for those seeking large ring styles. Several styles and attributions are available through the emerald shape diamond, and many mounting styles can redefine a designer’s selection. During mounting, the above-mentioned ratio is incredibly accommodating, and it’s exceptionally adaptable to a variety of shapes and trends. Often, suppliers base selections off of consumer interest, as the emerald shape diamond is quite popular.